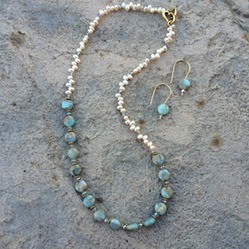 This is African Opal Jasper gemstones, with delicate side-drilled Freshwater Pearls, and tiny crystals. 20" long. Matching earrings also as shown. Sold as a set.